The purpose of this research is to analyse the thermal behaviour of South Holland provincial parks during heat waves, in order to provide design adaptation guidelines to increase their cooling capacity over the hotspots present in their urban surroundings. This research analyses the thermal behaviour of different land use patches (forests, cropland, grassland, water surfaces, built areas and greenhouse areas) present in the six South Holland provincial parks during heat waves. It studies their average night land surface temperature (LST) (with Modis 11A1), day LST (with Landsat 5TM), NDVI, imperviousness, patch size and patch shape index, and analyses through a multiple regression analysis the impact of each of these last four parameters in the night and day LST for each land use. 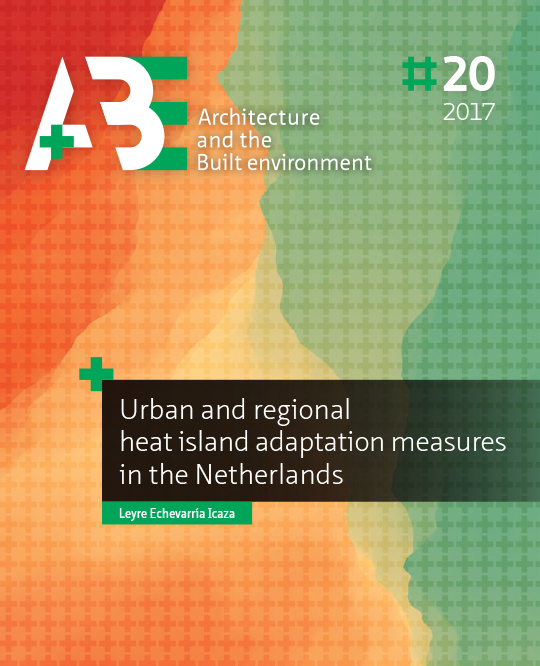 Based on these conclusions, a set of design guidelines are provided to improve the cooling capacity of Midden-Delfland park areas which are adjacent to hotspots with day LST above 41°C and with day LST between 36°C and 41°C. The average day LST within South Holland provincial parks varies from 25.9°C for water surfaces, to 31.4°C for forests, 33°C for cropland, 33.1°C for greenhouse areas, 34.9°C for grassland patches and 37.9°C for built areas. Within each land use category, NDVI, imperviousness and patch shape index influence differently the thermal behaviour of the patches. NDVI is inversely correlated to day LST for all categories, imperviousness is correlated to day LST for all areas which do not comprise a significant presence of greenhouses (grassland and built patches) and inversely correlated to LST for areas with a high presence of greenhouses (cropland and warehouses). Finally, the shape index varies depending on the nature of the surrounding patches, especially for small patches (built areas, forests and greenhouse areas). Most of the hotspots surrounding the Midden-Delfland park are adjacent to grassland patches. The measure to increase the cooling capacity of those patches would consist in a change of land use and or an increase of the NDVI of the existing grassland patches. These suggestions to increase the cooling potential of the parks remain deliberately open in order to allow combining these measures with other spatial planning priorities. ECHEVARRIA ICAZA, Leyre; VAN DEN DOBBELSTEEN, Andy; VAN DER HOEVEN, Frank. Using satellite imagery analysis to redesign provincial parks for a better cooling effect on cities. A+BE | Architecture and the Built Environment, [S.l. ], n. 20, p. 231-270, dec. 2018. ISSN 2214-7233. Available at: <https://journals.open.tudelft.nl/index.php/abe/article/view/3478>. Date accessed: 26 apr. 2019. doi: https://doi.org/10.7480/abe.2017.20.3478.